The average salary for a diagnostic medical sonographer in Vermont is around $73,880 per year. This is 12% above the national average. ● Updated in 2016. Diagnostic medical sonographers earn an average yearly salary of $73,880. Wages typically start from $54,450 and go up to $96,980. How much does a diagnostic medical sonographer make in Vermont? How much does a Diagnostic Medical Sonographer earn? Diagnostic medical sonographer salaries vary depending on industry. Areas of the industry that pay well include specialty hospitals, outpatient care centres, and colleges, universities and professional schools. 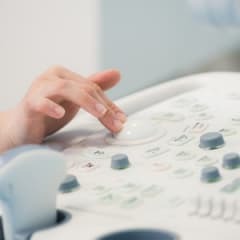 The top paying states for diagnostic medical sonographers are California, District of Columbia, Oregon, Washington, and Massachusetts. Industries with the highest levels of employment in this occupation are general medical and surgical hospitals, offices of physicians, medical and diagnostic laboratories, outpatient care centres, and specialty hospitals. States with the highest employment levels are California, Florida, New York, Texas, and Pennsylvania. How do diagnostic medical sonographer salaries compare to similar careers? Diagnostic medical sonographers earn about the same as related careers in Vermont. On average, they make less than biomedical engineers but more than clinical nurse specialists.